Caffe Nero opened their first branch in Ireland this month and hopes it will be start of a major investment. THE BRITISH COFFEE chain Caffé Nero has opened their first Irish outlet, the first part in a planned €20 million investment. The chain hopes to create 320 jobs after opening the Merrion Row branch earlier this month. The company has branches in the UK, Poland, Cyprus, Turkey and the Middle East and has 500 shops on top of their own roastery. 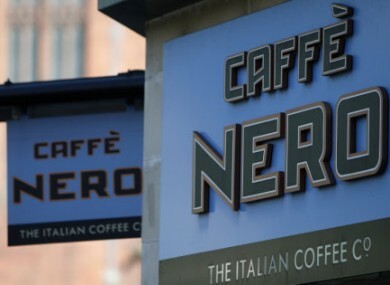 Speaking about the opening of the Merrion Row store, Gerry Ford, Chairman and founder of Caffè Nero said that the company was aiming to expand, but did not put a timeframe on the expansion. “We are delighted to be introducing Caffè Nero and the entire Caffè Nero experience to Dublin coffee drinkers for the very first time. Email “Coffee chain to invest €20 million, creating 320 jobs”. Feedback on “Coffee chain to invest €20 million, creating 320 jobs”.